We celebrate the artistry of meshing by sharing these mesh images formatted for use as your computer desktop’s wallpaper. 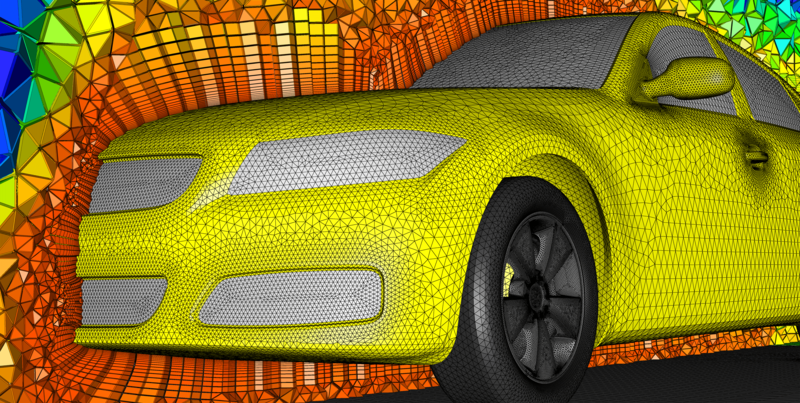 We are proud to share and make available as a computer desktop wallpaper the Pointwise poster that won the Meshing Maestro Contest at the 25th International Meshing Roundtable. 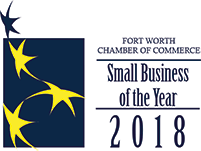 Carolyn Woeber, Travis Carrigan, John Dreese, Daniel LaCroix from Pointwise, Inc. 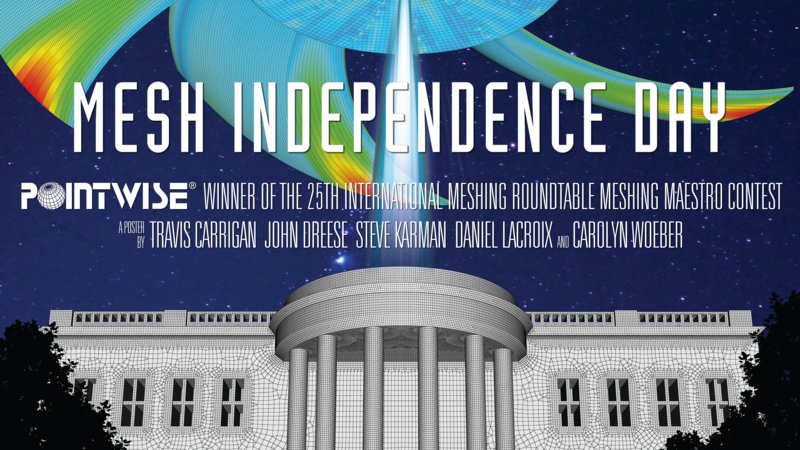 The Pointwise team, comprised of Carolyn Woeber, Technical Support Manager; Daniel LaCroix, Ph.D., Senior Engineer; John Dreese, Senior Engineer; and Travis Carrigan, Technical Sales Manager, is the winner of the 25th International Meshing Roundtable Meshing Maestro contest. The four engineers on the wining team have varying degrees of mesh generation experience and specialization. Their collaboration resulted in a variety of grids with differing approaches for both geometries involved. The poster's leading image featured an exhaust fan, gridded with a multi-block structured approach for the passages through the fan blades. Conversely, the White House surface mesh was created using an advancing front algorithm, utilizing quad-dominant cells. The inspiration for the poster was the 1996 blockbuster film Independence Day. We are proud to announce that Tessa Uroić's grid, Formula 1 Tire, won the Wallpaper Contest 2015. Tessa Uroić graduated from Faculty of Mechanical Engineering and Naval Architecture, University of Zagreb in 2014 with diploma thesis: Constrained optimization of a tube bundle heat exchanger under uncertainty, supervised by Prof. Hrvoje Jasak and Dr. Henrik Rusche. She is currently a Ph.D. student working as a member of Prof. Jasak's computational fluid dynamics (CFD) group in Zagreb. Besides working on a Ph.D. thesis (Implicitly coupled algorithms) and industrial projects, she is responsible for generating meshes for the entire group. 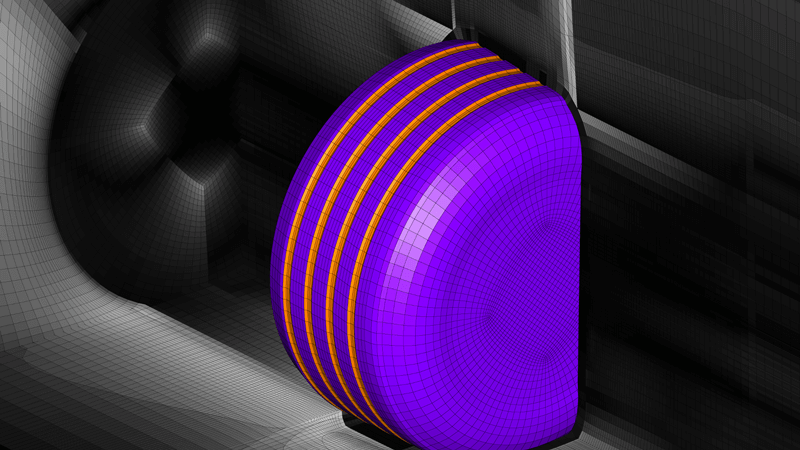 A block structured mesh around an asymmetrical Formula 1 tire with grooves. The wheel has a negative camber angle which made the mesh more complicated to make. It has eight million cells and it was used in OpenFOAM® simulations as a test case for comparison of different solvers. Results were presented at the 10th OpenFOAM Workshop in Ann Arbor, Michigan.